The combination of our stock range of motors and controllers with the customisation and bespoke programming options we offer means we’re confident we can deliver the package you need. The Zikodrive standard range typically covers power ranges between 0-1Kw but we have carried out higher power projects on a bespoke design basis. 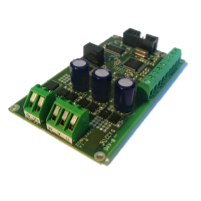 If you need something higher powered why not request a customised motor controller quote now? Customised or bespoke motor controllers deliver value for money, efficiency and can be tailored to fit your design requirements. Whether it’s a customised communication protocol, physical dimensions limits or something else – we’re confident our controllers can deliver what you need. By going down this route there are also a range of other potential benefits that can be gained. These include increased efficiency, designs optimised to the specific requirements of your project and more. In short, this option delivers the perfect motor controllers for your application. All of our motor controllers are designed and manufactured in the UK to the highest possible standards. This provides you the peace of mind that when you use a Zikodrive Motor Controller or Zikodrive bespoke designed motor controller you are getting the best possible build quality that will stand the test of time. Whatever you choose for your application (whether it be stock, customed, bespoke or OEM) we will support the controller fully. If it’s help setting up you need, on site tuning or optimisation to get the performance perfect or a range of programming options to deliver the range of options you need, we can help. Our engineers can work with you via a range of mediums including in person to set up, install and perfect the motor control solution your application demands. We enjoy working with different companies on a variety of different projects. If you have a highly specific motor control requirement then we will work with you to develop the specification in detail before embarking on the design work. If you’re a small company or are looking to run the project on a collaborative basis in order to attract innovation funding or additional revenue streams we are happy to work with you to accomplish this. If this is the case we would request you contact us directly to discuss this before requesting a quote for the project. If needs be we can arrange meeting in person, via Skype or conference call to discuss the project as appropriate.